It may not get as much recognition as other popular cities in Florida, but Jacksonville is rich with beauty and culture. If you need convincing, simply look around: there’s the towering skyline, peaceful beaches, thriving cultural hotspots, and countless local art displays dispersed across town. And guess what? All that beauty is going to look great on your Instagram. Up your photo game with shots at these gorgeous Instagram-worthy backdrops in Jacksonville, FL. 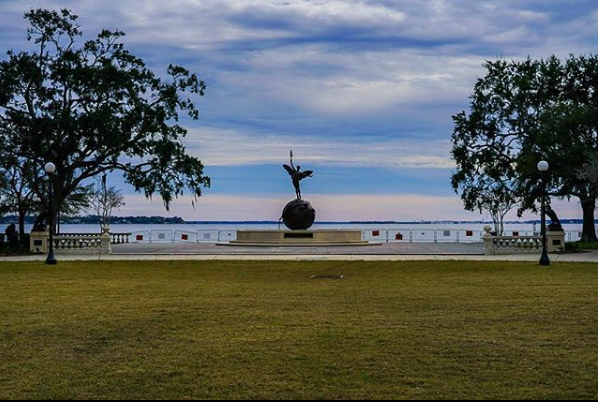 Snap a photo of a sunset over the St. Johns River or the iconic bronze sculpture, Life, standing proudly in the center of the park; Memorial Park has so many great spots for stunning pictures. While it may not be the hotbed of activity it used to be, the Landing still offers opportunities for some incredible photos of the Jacksonville skyline, especially at night. Though not technically part of Jacksonville, Ponte Vedra Beach is close enough to count it. Plus, it’s hard to find a better spot for all your #beachlife photos than the towering sand dunes found here. One of Jacksonville’s most unique destinations is also one of its best-kept secrets. 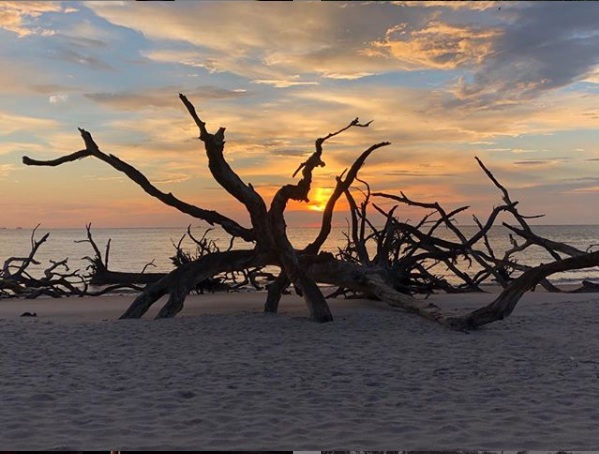 Dark rocks, saw palmettos, and the bleached driftwood give this beach an otherworldly quality that make it the perfect backdrop for gorgeous photos. Here’s a true #onlyinduval. 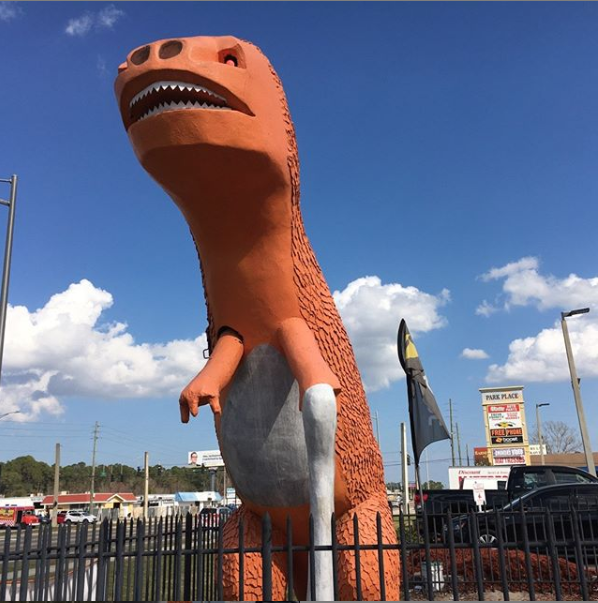 Rex the Beach Boulevard Dinosaur is a Jacksonville icon who originally stood tall as a prop at an old miniature golf course. Now he presides over a shopping center on Beach Boulevard, welcoming Instagrammers from all over. Who doesn’t love a fountain? Friendship Fountain was renovated just a few years ago, ensuring it’ll be a staple of photos for a long time. Add some history to your Instagram with a picture in front of the 200+ year old oak tree that gives this park its name. Local mosaic art company Roux Art, Inc. created this stunning mosaic meant to celebrate and evoke the inimitable beauty of the St. Johns River. Artist Okuda created this colorful mural as part of Art Republic 2017. 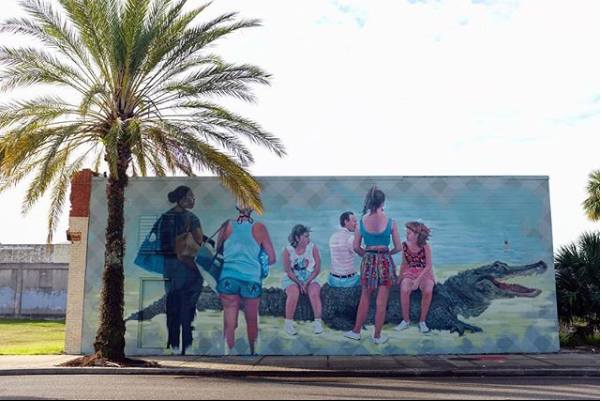 Inspired by the important roles women have played in Jacksonville’s history, this mural is a great backsplash of color for your next selfie. 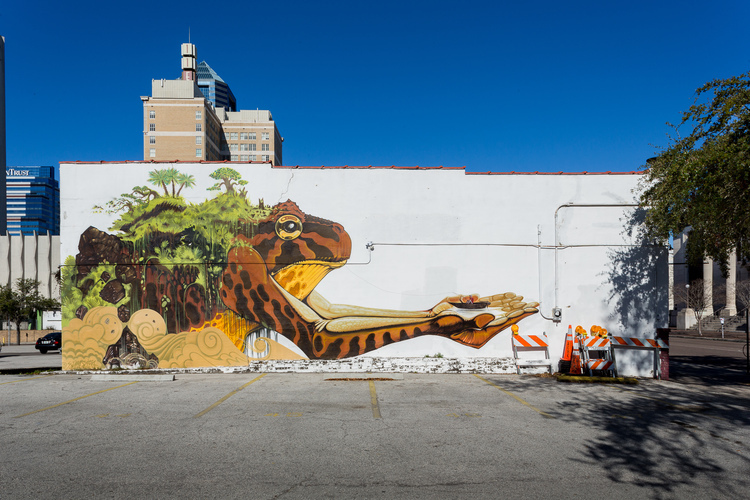 These dazzling murals adorn pillars in what used to be less traveled areas of downtown Jacksonville. Their presence has certainly helped alleviate that. Earth Gods presents a visually arresting commentary on a topic as old as the earth itself: mankind’s relationship with nature. Larger-than-life art and a potent message? Leave your followers with something to chew on with this one. Floating Land, just like the local treasure upon which it sits, is easy to get lost in. Grab a pic of the awe-inspiring memorial before heading inside to Chamblin Uptown and venturing into other worlds with shelves upon shelves of literary adventures. Energetic, frantic, and fragmented – all these words describe the lively Detroit Moves mural. Does it remind you of techno? That’s no coincidence; artist Kenor was inspired by the electronic scene in Detroit. Would people really believe you traveled to Jacksonville if you didn’t show them a picture of a bunch of people sitting on a giant alligator as proof?